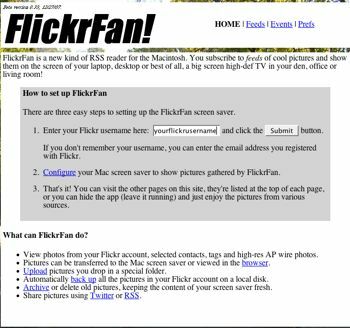 RSS and podcasting pioneer Dave Winer has a new project, FlickrFan, that’s a platform for uploading and downloading Flickr images. Even more important, though, it’s an attempt to turn your HDTV into a platform that embraces the Internet. All ready for your new Mac Mini and high-def TV. FlickrFan lets you use folders on your Mac to sync content up to Flickr. You can use subfolders for tags. The app also can automatically download images from Flickr to you screen saver folder, so your screen saver can show the latest photos from your Flickr subscriptions. FlickrFan grew out of Winer’s dissatisfaction with Apple TV and the desire to create a platform that extends the Internet to big screen TVs. “Think of it as the networked living room and you’ll understand the vision,” adds Winer. FlickrFan is in beta and it’s definitely for the first-adopting geeks. It runs within Winer’s OPML editor, which is a powerful platform, but not one for most end-users. What’s most interesting about FlickrFan, though, is not that it lets you put Flickr photos on your big screen TV – it’s that Winer is thinking about turning your big screen TV into a platform. A platform for photos, yes, but also a platform for Internet television, web surfing and anything else that developers want to throw at it. It’s an obvious direction for Internet media, but it’s a direction that Apple, Microsoft and others have been hesitant to take. Apple TV, for example, is a closed platform that’s more of an iTunes peripheral than an Internet television device. FlickrFan is a push in the open direction, a push towards making your HDTV a two-way multimedia platform. You can download FlickrFan for free from FlickrFan.org. Thank you for trying out FlickrFan! This page contains the terms and conditions (“Terms and Conditions”) for FlickrFan. By downloading FlickrFan, you agree to this agreement either for yourself or on behalf of your employer or another entity and agree to be bound by its terms and conditions. If you are accepting on behalf of your employer or another entity, you represent and warrant that you have full legal authority to bind your employer or such entity to these terms and conditions. If you don’t have the legal authority to bind, please press the “I do not accept” button below. FlickrFan is made available to you for your personal or internal business use in compliance with all applicable laws, rules and regulations. If you want to make commercial use of FlickrFan, including but not limited to selling or distributing FlickrFan for payment, you must enter into an agreement with Scripting News, Inc. (“SNI”) or obtain SNI’s written permission in advance. If you are asked to register you must provide complete and accurate identification, contact, and other information required as part of the registration process. SNI reserves the right to refuse or discontinue participation to any applicant at any time in its sole discretion. Except for distributions for internal business and/or personal use to your employees or contractors in compliance with these Terms and Conditions, you may not distribute FlickrFan or any services or software associated with or derived from it, modify, copy, license, or create derivative works from FlickrFan, unless you obtain SNI’s written permission in advance. Once you have obtained SNI’s permission, you may make copies of FlickrFan and distribute such copies to others provided that any such recipient has had an opportunity to review and agree to be bound by these Terms and Conditions. If others to whom you’d like to distribute FlickrFan do not have this opportunity to review and agree to these Terms and Conditions but you would still like to distribute copies to them, you may do so provided that you have the legal right to bind each of those third parties to these Terms and Conditions. If you do not have this right and the recipients do not have an opportunity to review and agree to these Terms and Conditions, you may not distribute FlickrFan to them. FlickrFan may communicate with SNI’s servers (unless you are using FlickrFan for internal business use and your settings prevent this communication) to check for available updates to the software, such as bug fixes, patches, enhanced functions, missing plug-ins and new versions (collectively, “Updates”). During this process, FlickrFan sends SNI a request for the latest version information. By installing FlickrFan (unless you are using FlickrFan for internal business use and your settings prevent this communication), you hereby agree to automatically request and receive Updates from SNI’s servers. You acknowledge that SNI or third parties own all right, title and interest in and to FlickrFan, portions thereof, or software or content provided through or in conjunction with FlickrFan, including without limitation all Intellectual Property Rights. “Intellectual Property Rights” means any and all rights existing from time to time under patent law, copyright law, trade secret law, trademark law, unfair competition law, and any and all other proprietary rights, and any and all applications, renewals, extensions and restorations thereof, now or hereafter in force and effect worldwide. You agree not to (and agree not to allow third parties to) modify, adapt, translate, prepare derivative works from, decompile, reverse engineer, disassemble or otherwise attempt to derive source code from FlickrFan, or to extract significant portions of FlickrFan’s files for use in other applications. You also agree to (and agree not to allow third parties to) not remove, obscure, or alter SNI’s or any third party’s copyright notice, trademarks, or other proprietary rights notices affixed to or contained within or accessed in conjunction with or through FlickrFan. If you have comments on FlickrFan or ideas on how to improve it, please visit flickrfan.org/feedback.html. Please note that by doing so, you also grant SNI and third parties permission to use and incorporate your ideas or comments into FlickrFan (or third party software or content) without further compensation or approval. SNI reserves the right to modify these Terms and Conditions from time to time in its sole discretion, without notice or liability to you. You agree to be bound by these Terms and Conditions, as modified. Please review the most current version of the Terms and Conditions from time to time, located at flickrfan.org/eula.html (or such successor URL as SNI may provide), so that you will be apprised of any changes. SNI and any third party who makes its software or content available in conjunction with or through FlickrFan disclaim any responsibility for any harm resulting from your use (or use by your employees, agents or contractors) of FlickrFan and/or any third party software or content accessed in conjunction with or through FlickrFan. FlickrFan AND ANY THIRD PARTY SOFTWARE AND CONTENT MADE AVAILABLE IN CONJUNCTION WITH OR THROUGH FlickrFan ARE PROVIDED “AS IS,” WITH NO WARRANTIES WHATSOEVER. SNI AND SUCH THIRD PARTIES EXPRESSLY DISCLAIM TO THE FULLEST EXTENT PERMITTED BY LAW ALL EXPRESS, IMPLIED, AND STATUTORY WARRANTIES, INCLUDING, WITHOUT LIMITATION, THE WARRANTIES OF MERCHANTABILITY, FITNESS FOR A PARTICULAR PURPOSE, AND NON-INFRINGEMENT OF PROPRIETARY RIGHTS. SNI AND ANY THIRD PARTY WHO MAKES ITS SOFTWARE OR CONTENT AVAILABLE IN CONJUNCTION WITH OR THROUGH FlickrFan DISCLAIM ANY WARRANTIES REGARDING THE SECURITY, RELIABILITY, TIMELINESS, AND PERFORMANCE OF FlickrFan AND SUCH THIRD PARTY SOFTWARE OR CONTENT. YOU UNDERSTAND AND AGREE THAT YOU DOWNLOAD AND/OR USE FlickrFan AND ALL THIRD PARTY SOFTWARE OR CONTENT MADE AVAILABLE IN CONJUNCTION WITH OR THROUGH FlickrFan AT YOUR OWN DISCRETION AND RISK AND THAT YOU WILL BE SOLELY RESPONSIBLE FOR ANY DAMAGES TO YOUR COMPUTER SYSTEM OR LOSS OF DATA THAT RESULTS FROM THE DOWNLOAD OR USE OF FlickrFan AND SUCH THIRD PARTY SOFTWARE AND CONTENT. SOME STATES OR OTHER JURISDICTIONS DO NOT ALLOW THE EXCLUSION OF IMPLIED WARRANTIES, SO THE ABOVE EXCLUSIONS MAY NOT APPLY TO YOU. YOU MAY ALSO HAVE OTHER RIGHTS THAT VARY FROM STATE TO STATE AND JURISDICTION TO JURISDICTION. UNDER NO CIRCUMSTANCES SHALL SNI OR ANY THIRD PARTY WHO MAKES ITS SOFTWARE OR CONTENT AVAILABLE IN CONJUNCTION WITH OR THROUGH FlickrFan BE LIABLE TO ANY USER ON ACCOUNT OF THAT USER’S USE OR MISUSE OF FlickrFan OR SUCH THIRD PARTY SOFTWARE OR CONTENT. SUCH LIMITATION OF LIABILITY SHALL APPLY TO PREVENT RECOVERY OF DIRECT, INDIRECT, INCIDENTAL, CONSEQUENTIAL, SPECIAL, EXEMPLARY, AND PUNITIVE DAMAGES WHETHER SUCH CLAIM IS BASED ON WARRANTY, CONTRACT, TORT (INCLUDING NEGLIGENCE), OR OTHERWISE, (EVEN IF SNI AND/OR A THIRD PARTY SOFTWARE OR CONTENT PROVIDER HAVE BEEN ADVISED OF THE POSSIBILITY OF SUCH DAMAGES). SUCH LIMITATION OF LIABILITY SHALL APPLY WHETHER THE DAMAGES ARISE FROM USE OR MISUSE OF AND RELIANCE ON FlickrFan AND ALL THIRD PARTY SOFTWARE OR CONTENT MADE AVAILABLE IN CONJUNCTION WITH OR THROUGH FlickrFan, FROM INABILITY TO USE FlickrFan AND ALL THIRD PARTY SOFTWARE OR CONTENT MADE AVAILABLE IN CONJUNCTION WITH OR THROUGH FlickrFan, OR FROM THE INTERRUPTION, SUSPENSION, OR TERMINATION OF FlickrFan AND ALL THIRD PARTY SOFTWARE AND CONTENT MADE AVAILABLE IN CONJUNCTION WITH OR THROUGH FlickrFan (INCLUDING SUCH DAMAGES INCURRED BY THIRD PARTIES). SUCH LIMITATION SHALL APPLY NOTWITHSTANDING A FAILURE OF ESSENTIAL PURPOSE OF ANY LIMITED REMEDY AND TO THE FULLEST EXTENT PERMITTED BY LAW. SOME STATES OR OTHER JURISDICTIONS DO NOT ALLOW THE EXCLUSION OR LIMITATION OF LIABILITY FOR INCIDENTAL OR CONSEQUENTIAL DAMAGES, SO THE ABOVE LIMITATIONS AND EXCLUSIONS MAY NOT APPLY TO YOU. These Terms and Conditions will be governed by and construed in accordance with the laws of the State of California, without giving effect to the conflict of laws provisions of California or your actual state or country of residence. If for any reason a court of competent jurisdiction finds any provision or portion of these Terms and Conditions to be unenforceable, the remainder of these Terms and Conditions will continue in full force and effect. These Terms and Conditions constitute the entire agreement between the parties with respect to the subject matter hereof and supersede and replace all prior or contemporaneous understandings or agreements, written or oral, regarding such subject matter. Any waiver of any provision of these Terms and Conditions will be effective only if in writing and signed by SNI and/or a third party who make its software and/or content available in conjunction with or through FlickrFan. Why the hell would anybody want to spend a thousand dollars to watch flickr photos on a $2,000 TV? Help! Can’t figure this thing out at all! gotta agree….hooking up to flickr is basically a “Hello World” test code for messing around with APIs. Don’t know what’s the big deal. We did this for wireless…so flickr gets called based on proximity.